Summer in the Kalahari has many faces. By late October it seems almost certain that the rains are going to stay away. The pans are empty with cracked dried mud which carries the footpints of birds antelope and cattle. 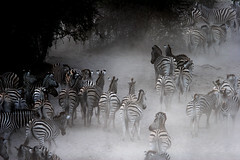 Thousands of zebra and wildebeest congregate at the waterholes in the dry Boteti river, playing a survival game. A quest for water and grazing, chased by elephants and ambushed by lions. It all translates into sound. At night, the trumpeting of elephants and the calls of the zebras. In the early hours of the morning the roaring of lions. At daybreak, carcasses near the waterholes and the cries of the vultures. Photography is a keen interest of mine. Here are some favourite shots – six in all – from Botswana’s Boteti River. Having worked and travelled a lot in Africa, I became increasingly aware of the magnitude of the AIDS pandemic, ultimately the story behind the novel. The numbers are mind boggling: 22 million people living with AIDS, 61% of them women, 11million orphans, 5700 deaths per day, 2 million deaths per annum. But these are only cold, clinical figures. They tell you nothing about the people involved, or the devastation caused on a more personal level. The doctors and nurses at a small hospital in an African town are fighting the uphill battle against the Aids pandemic, made worse by the interventions of Holmes, the budget-conscious superintendent, and his bungling sidekick, Thunderbird. The rebellious and profane Morgan thwarts every new rule in his quest to save his patients, most of whom are dying because they lack the resources to buy back their lives with over-priced drugs. His efforts are valiantly supported by the enigmatic Oumar, the likeable Kenyan, the beautiful Violet, and Rebecca, the battleaxe with a heart of gold. Then there is Mary, with her passion for birds, holding Morgan’s heart in her frail hands; Naledi, the success story, who is brought back from the brink of death; and Rastodika, the untameable spirit. When funds are needed for a kidney transplant, Morgan conspires with Father Michael; Dorcas, the shebeen queen; and Rachel, the whore, to make the rich Mr. B organise a Beerfest to pay for the operation. But then things don’t work out exactly as they had planned. Father Michael’s lottery depicts the complex human reality of Aids with a moving combination of compassion, humour and defiant indignation.Above all, in its vivid accounts of medical battles won and lost, it asserts the value of attempting to preserve life in the face of near-certain death. » Find the best price online in SA! » Buy now on Amazon.com!